You can see the national parks and the forests that make up the Nilgiri Biosphere Reserve in the map above. At the top left is the Nagarhole National Park, now called the Rajiv Gandhi National Park, in Karnataka. Move down and there is the Bandipur National Park (link to park's page on the Project Tiger web site), also in Karnataka. Not marked on the map is the Muthunga Wildlife Reserve, also called the Wayanad Wildlife Santuary. It is the same forest, but in the state of Kerala. Move further down, and the forest is called the Mudumalai Wildlife Santuary and National Park in the state of Tamil Nadu. At the very bottom you have the Silent Valley National Park. BTW, what's so great about the Nilgiris? Apart from the famous aromatic tea that is grown on the hills of the Nilgiris in Kerala and Tamil Nadu, these are also the ranges in the state of Tamil Nadu. The Nilgiris Biosphere Reserve is an international biosphere reserve in the Western Ghats, occupying an area of more than 6000 square kilometers in the states of Kerala, Karnataka, and Tamil Nadu. The Mudumalai National Park, Muthanga Wildlife Reserve, Bandipur National Park, Nagarhole National Park, and the Silent Valley National Park are part of the reserve. Which should give you ample hints that this is an area of incredible plant and wildlife diversity. These photographs below are ones I took while driving through the Bandipur and Mudumalai national parks. The road through the Bandipur National Park is quite ok. While it is not a good idea to speed through the park, any time, you can drive comfortably at 40-60kph, or even faster, but that would be silly, wouldn't it, to drive through a forest at high speed. Driving during the day is obviously more advisable since at night the animals come out and sometimes onto the road, so if you are driving at night it is likely you may not see them and end up injuring these animals. These wildlife reserves are the last remaining refuge for these wonderful animals, so take care. Spotted deer, chitals are to be found by the hundreds, thousands in these parks. While that's a good sign, if there are too many herbivores abounding in a jungle, it is usually taken as a sign that there are not enough carnivores present in the jungle. In tiger reserves that is not a good sign, as it suggests that there are not enough tigers left, which is causing the deer population to balloon uncontrollably. As you come to the end of the Bandipur national park, you are also at the Karnataka-Tamil Nadu border. Enter the state of Tamil Nadu and the forest changes name. It is called the Mudumalai Tiger Reserve. The Moyar river flows through the forest, and during the summer months it is not only a source of water for the animals, but also a good place to come by to spot these animals, since the smaller water holes and ponds have mostly dried up in the sweltering summer heat. Just outside the Mudumalai reserve, or perhaps inside it, I do not remember, there are huge swaths of giant bamboos. These are immensely long, reaching up to 100 feet or so, and bend under their own weight, forming an amazingly beautiful canopy over the road. If you care to stop at the Mudumalai sanctuary post office, you can pick up a collection of canceled stamps. Don't know what those stamps are. If I do, I shall write about them. As you reach the border of the national park, the signs proclaim so. And the Karnataka border and the Bandipur National Park beckons. There are both wild and trained elephants in the forest. You are unlikely to come across wild elephants near the highway though. This photo above is at the other end of the Bandipur national park, just outside the town of Gundalpet. 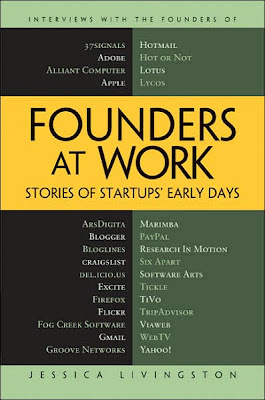 See my first post on the review of this book at Founders At Work-1 (link to blog post). This is a continuation of the review, in the form of snippets from the book, interspersed with my gyan thrown in. So this is the book review, bhag dwitiya (भाग द्वितीय). One thread that seems to run through most of the interviews, when it comes to VCs (venture capitalists), is that VC participation more often than not brings in more troubles and problems than benefits. VCs either take undue advantage of the naivete of the founders to take a lion's share of the equity in a company in return for money, or they foist their chosen management on the company, management that turns out to be more often than not spectacularly incompetent. Sabeer Bhatia was the original Indian entrepreneur that most Indians became aware of in the US in the 1990s. There was Vinod Dham, from Intel, who headed the design team for the Pentium chip, but it was Sabeer, who was known as the man who cofounded Hotmail, and then sold it to Bill Gates' Microsoft, another person and company that Indians adulated, for US$400 million. The whole VC community has so many links with each other—you never know. Netscape was building email servers. What if the VCs were just to say to them, “Hey, why don’t you do web-based email?” And that’s it, that’s the idea, right? There was not that much to protect in terms of IP. Whoever built it first would win the market. So we were afraid and that’s why we kept that as the secret. Nobody knows this, but the round before the deal with Microsoft, they literally put $5 million in the company just because they knew it was going to get sold and that we needed some bridge money. Also, when you are hardware designers, you have tremendously more discipline in writing and describing software because in hardware you cannot get it wrong. Every turn of every chip costs you millions of dollars, so when hardware designers design any piece of software, they normally get it right. ... Whereas the pure software writers—the way they think and architect software is very creative. They put in lots of bells and whistles, but they think, “No big deal. If there is a bug, we’ll fix it. Put in a patch.” You can’t do that in hardware. There’s no patch. Once you ship a chip, it has to work all the time. Why do I think this statement is interesting? First, there is no research that I am aware of that has been conducted that has looked at this proposition, where the productivity and quality of code hammered out by 'pure software writers' was compared with code written by 'hardware designers'. So what Sabeer says is opinion. Anecdotal opinion, based on a sample size of one or two. Second, if hardware designers were so often better than software writers, we would have seen a whole lot more hardware designers get into software than has been the case. Which has not been the case. True, many hardware designers love their craft and would not want to move. Job mobility may not be that great. But there should have been a steady trickle of people from hardware to software, and with mostly successful results, had Sabeer's statement been true. Third, companies that have a fair number of hardware designers, like Intel, IBM, AMD, TI, Qualcomm, Cisco, Juniper, etc... would have entered the pure software market long ago, and been much more successful than software companies like Microsoft, Oracle, SAP, Yahoo, Google, and others. Which has not happened. Cisco and Juniper write software for a narrow range of products, for their own line. It stands to reason that companies are always looking to enter markets where they can leverage their existing skills and positions in markets to prise open new markets. Fourth, Sabeer's statement is a bit like saying that brain surgeons cannot afford to get it wrong, so they are likely to be better software designers that existing software designers. Sure, brain surgeons are smart people, but would their skills transfer as easily, or as successfully into other spheres? They **may** turn out to be very good software designers, and many people would not dispute that statement, but what should also be obvious is that to build skills, to build very good skills, in any discipline takes time and effort. Hardware engineers are good at what they do, while software engineers are good at what they do. Skills and expertise in one area will not translate into success in the other area so easily. Google has made quite an impression on Sabeer. He is however ambivalent whether he would have wanted to become another Google-type success. Sort of a moot point really, if you look at it. If we had gone the licensing route, I think we would have been as big as Google. Because that’s what Google did, right? Initially, they said, “We’ve got search. Why don’t we license search to everyone else?” That was their original business model. They licensed it to Yahoo, Microsoft, and AOL and grew big based on their subscribers. Livingston: Do you wish you had gone the licensing route? Bhatia: No, it would have been a lot more difficult, because the cost of providing email was much higher than the cost of providing search—even though search is far more profitable than email in terms of the advertising monetizability of search. But having that customer base and being able to tap into that customer base and upsell them on services, or advertise—you can always make money off them. It is likely that you **may** make money off a large customer base, and certainly you cannot expect to make money without customers, but it is by no means guaranteed that customers equals money. Look at Flickr, YouTube, Twiter, mySpace, Orkut, or Facebook - beyond advertising, there is really no other way that these companies could make money. Maybe a revenue model will evolve that will be an amalgamation of existing models, combined with innovations applied, and some new models that are evolving someplace. Maybe a big telecom company will acquire one of these social networking sites, and drive users towards using their mobile phones as the primary interface of interaction. Flickr several years after getting acquired by Yahoo, and Facebook despite having 160 million members continue to struggle with making money, multi-million dollar valuations notwithstanding. They may well end up making money, but by no means can one say **always**. Livingston: Do you think your mixed background of business and engineering helped you? Brady: It’s hard to know, since you don’t know the alternative. Probably more than anything, the business education gave me the confidence to know what I knew and what I didn’t know. Also read the same chapter for Tim Brady's take on Hotmail, how they missed it, could have acquired it, later caught up in that market with the acquistion of Rocketmail, which became Yahoo Mail, and eventually became bigger than Hotmail in nterms of subscribers. Till Gmail came along... And a business model for premium email collapsed overnight, a model that rode on the back of providing 20MB of email quota, and charging $20 a year for that. Most of the world today knows of Ray Ozzie as the Chief Software Architect at Microsoft, a title till recently held by Bill Gates. But Ray was known and respected long before that. After he led the development of Lotus Symphony, Mitch Kapor and Jonathan Sachs decided to invest in Ozzie’s idea, which would become Lotus Notes. Instead of working as an employee, Ozzie founded Iris Associates in 1984 to develop the product for Lotus. It was an unusual form of startup, but it worked. His is a viewpoint that is quite grand in vision, to use the phrase. Maybe 'methodical' is the phrase I am looking for. A view that implies ample forethought. He is certainly neither ignorant nor vain in assuming that good, great, successful software takes no time to build. Even Google the search engine is today much different than what it was in 2000, if people can remember a time as long back as the start of the millennium. At any given time, you’ve got to have a technology roadmap in your mind and a market roadmap as to where things are headed—broadband is getting increasingly pervasive or wireless is getting increasingly pervasive, or something is going on—and trying to project out several years, because it will take you several years to build anything that’s worth building. Of the many chapters I have read in the book, this is perhaps the only one that actually talks of creating companies or joining startups with forethought rather than taking things as they come, which often happens with startups, more by accident than design, where success and the formation of the company before that is less planned than accidental. And I do not mean accidental in any pejorative sense. Companies take their shape based on the personality characteristics and human interaction characteristics of the founders. This is true in every company. Learn about the kind of culture that you want to create in your own company based on the positive and negative aspects that you witness in the people that are your leaders. Learn to respect and appreciate other people’s skill sets, because you are going to need other people if you do start a company and you are a technologist. Understand that it’s a rare, rare case when a tech entrepreneur is the right one to lead a startup for a long period of time. of Basecamp and more importantly, Ruby on Rails fame. So now we had this extensive billing system focused on billing once a year and we couldn’t use it. We had to go back and make it monthly instead. But this turned out also to be a blessing. So we pushed back the launch about a month, and now we charged monthly, but we charged twice as much. The plan that was before $99 a year is now $19 a month, $224 a year instead. In a company where everyone is in the same place, it’s very easy to walk down the hall and interrupt somebody. If you’re part of a distributed team that’s 7 hours off, you’re bound to have a good portion of the day where you just get work done. There are no interruptions. Another thing is that we communicate mainly through IM, which is a fairly low-bandwidth way of communicating, so you’re not going to disrupt somebody unless you’re going to say something that matters. If you meet in person, it’s very easy to just talk for 30 minutes, and what was the information exchange actually about?